A lactating adenoma is a benign tumor that usually occurs in younger, pregnant and lactating women. It is a variant of a class of benign breast lesions called ‘fibroadenomas‘. A pronounced growth of ducts and fibrous connective tissue, including the glandular components, typify this group of lesions. The formation of cysts often accompany the development of fibroadenomas. There is a sub-category of fibroadenoma ‘tubular adenoma‘ that occurs when the tumor mainly consist of glandular tissue but with little stroma. Lactating adenomas are essentially tubular adenomas that occur in pregnant or breast feeding women. The lesion often contains secretions of breast milk. Lactating adenomas are usually benign. However in rare instances lactating adenomas can occur simultaneously with breast carcinoma. Because of this medics need to carefully evaluate lactating adenomas. This page has some helpful information. However, we have a new page on benign hyperplasia, including lactating adenomas. So, go ahead and take a look. A lactating adenoma lesion will often appear in a lobular, non-capsulated shape, with well-circumscribed margins. Some lactating adenomas will have evidence of infarction (a process of tissue death). “Necrosis” caused by a blockage of the tissue’s blood supply. However, lactating adenomas on their own, are not a risk factor for breast cancer development in any way. Lactating adenomas may occur singularly or in multiples. In the image of lactating adenomas to the right, one notes clusters of hyperplasic (newly developed) ducts, and dilated lumen containing milk secretions. The presence of so many new ducts would distinguish a lactating adenoma from a ‘galactocele‘, which is essentially a build of up milk secretions due to blocked ducts, but with no new tissue growth. A lactating adenoma is usually quite apparent radiologically as they tend to have the same regular shape and well-defined margins of fibroadenomas. 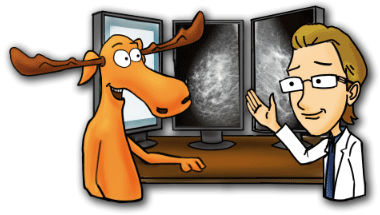 The secretory milk by-products will usually show up as ‘fat’ on both mammography and ultrasound and this is often the key to a diagnosis. All of which are suggestive of breast cancer. The confusing presentations are most commonly the result of infarction but a core needle biopsy is usually necessary, just to be sure. Specialists think that hormonal imbalance from pregnancy and breast feeding are one of the underlying causes of lactating adenomas. Following pregnancy and lactation, lactating adenomas will usually regress spontaneously and often no additional treatment is necessary. However, sometimes the treating physician will prescribe bromocriptine or another dopamine agonist to help ‘shrink’ the size of the tumor. This drug, however, will suppress lactation and may have other side effects. If the lactating adenoma is thought to be a serious and inconvenient health problem, surgical removal may be necessary. What does lactating adenoma look like? A lactating adeonoma may present as a breast lump that feels either rubbery or firm and has a yellow to tan-color with a lobulated cut surface. A lactating adenoma often presents as a palpable mass that undergoes rapid growth and may be large in size. What is the cause of lactating adenoma? Hormonal changes during and after pregnancy are the cause of lactating adenoma. Women will often find a lactating adenoma on breast self-exam during the third trimester of pregnancy. No. They are usually painless. How will a breast lump during pregnancy or breast feeding be investigated? Due to the changes in the breast during pregnancy and breast feeding, such as breast engorgement, radiographic density is so increased that mammograms are often ineffective. Doctors prefer the method of ultrasound because it can determine whether the breast lump is solid or cystic in nature. If the diagnosis is a solid mass, fine-needle aspiration is usually necessary. However, ultrasound has been related to some false negative and positive results in lactating adenomas. Therefore, ultrasound guided core biopsy is often the method of choice for diagnosis. What is the lactating adenoma treatment? Medics will recommend a core biopsy for tissue sampling. Medics may prescribe the drug Bromocriptine to reduce the size of a lactating adenoma. This drug works by suppressing prolactin levels. What part of the breast does lactating adenoma occur? There may be a predilection towards the anterior portion of the breast. Development of a milk fistula following needle core biopsy, and they can cause development of foci of infarction of breast tissue. What does the differential diagnosis include? Is there an increased risk of breast cancer? No, lactating adenomas are not thought to carry any increase to the risk for breast cancer. In effect, lactating adenomas are benign lesions. They are more common in pregnant women than in those breast feeding and often present as large, palpable breast masses. Back to our benign breast lesions list or Updated Breast cancer Incidence and Mortality list of posts or our newer breast cancer site.